1) It is possible to have a small reduction in LCD power consumption by displaying black vs. white. The gap isn't anywhere near as dramatic as it can be on an OLED display, but it can be measurable. 2) It's possible that Apple is putting the SoC into an even lower power state when a video playback scenario is triggered. Although I let all of the tablets hit a steady state power consumption before recording the result in the homescreen test, it's possible that after an even longer time the SoC would hit a lower power state that's entered more quickly as soon as video playback is detected. Remember that modern SoCs can power gate quite a bit of the logic on the chip during video playback. 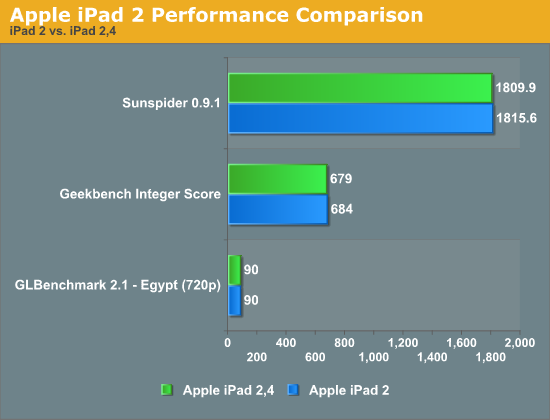 Under heavy CPU load (multithreaded Sunspider) we see a 28% increase in power consumption from the 45nm iPad 2,1 compared to the newer 2,4. Keep in mind that we're looking at peak power consumption here, which helps explain the smaller gap on the GPU side than what we saw in our battery life tests. What this data does show however is that the power efficiency improvements can be just as significant for CPU bound workloads, it's simply harder to find workloads that are CPU bound for long periods of time. Looking at the 3rd generation iPad data reminds us of just how power hungry that platform is. It truly is Apple's performance halo, and it's the perfect target for a 32nm SoC in the future. The iPad 2 battery life comparison numbers were generated on a lightly used iPad 2 with fewer than 20 charge cycles. While it's possible that some of the differences highlighted on the previous page are due to differences in the batteries between these two devices, it's likely that the variance is in the single digit range at best due to the limited number of charge cycles on the iPad 2 (Update: we confirmed the delta between our iPad 2 results and a brand new, out of box 45nm iPad 2 was < 3%). The power consumption numbers above remove the battery from the equation and help to validate these numbers. The iPad 2,4 manages to shave off a degree of surface temperature. It's not really noticeable, but it's there. 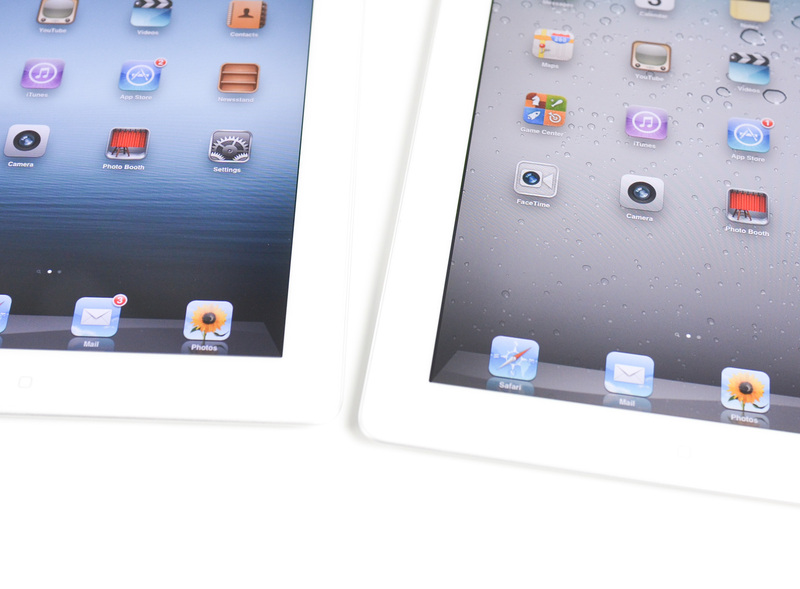 There's no performance difference between the iPad 2,4 and the older iPad 2 models. Regardless of whether you're looking at CPU or GPU performance, the new and older iPad 2s are indistinguishable. Apple definitely embraced the console mentality with this launch. One difference you will notice between iPads however is variance in the panel vendor and resulting performance. Similar to what we've reported on in the Mac space, Apple likes to get 2 - 3 vendors for most components with very few exceptions (e.g. the CPU/GPU/SoC). We've seen this primarily be an issue with displays and storage devices in Macs, but on the iPad/iPhone side of the fence it can definitely be noticeable as the display plays such a major role in the experience with these devices. The iPad 2,4 I'm reviewing has noticeably different display characteristics compared to my older iPad 2. My 2,4 sample has a higher maximum brightness (and black level), better grayscale color accuracy, and lower color temperature (more yellow). The new panel isn't any worse than what we've reviewed previously, in fact it's actually slightly better in a number of areas, although some users may be put off by the lower white point temperature (6200K vs. 6600K). The panel I ended up with here isn't specific to the 2,4, but rather something you could end up with in any iPad 2 model. This is nothing new, but it's always interesting to get an idea of the amount of variance Apple considers acceptable. The new iPad still appears to be in the single or dual source stage (there's conflicting information about whether or not LG made panels are also available today). Sharp is expected to come online in the near future as another source. It remains to be seen how those panels will fare compared to the excellent Samsung panel that Apple launched with however.